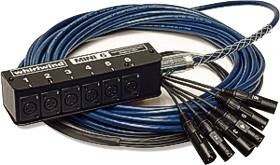 The MINI-6 and MINI-12 are ideal drop snakes for cleaning up cable runs in the studio or on stage. Use them for a keyboard rig, a complex drumkit setup, or any place you need to gather up mic lines. Both units feature clearly labeled side-exit connectors and fit in many places where a traditional box would be too bulky.